This unisex Born at Home Outfit is the perfect neutral baby shower gift for someone planning a home birth! This outfit is ideal for a newborn birth announcement! Our unique design is professionally printed on soft, breathable cotton so your baby will be stylish and COMFORTABLE! 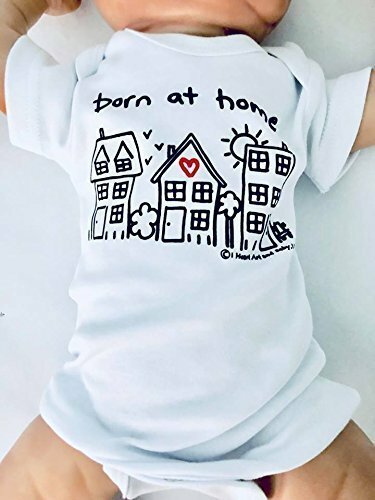 LISTING DETAILS - Size: Newborn (0-3 Months) or up to 12.5 pounds - Sleeve Length: Short - Material: 100% Cotton, Ink - Garment Color: White - Ink Color: Black and Red - 3 Snap Closure (perfect for easy diaper changing!) - Machine Washable (Inside out, Gentle Cycle, Hang Dry) - Packaged in a clear poly bag ______________________________________________________________________________ WANT A DIFFERENT COLOR? PINK: https://www.amazon.com/dp/B07CZ15L5G BLUE: https://www.amazon.com/dp/B07CZ1ZCH5 WANT THIS OUTFIT WITH LONG SLEEVES? https://www.amazon.com/dp/B075HLKJ6P WANT TO SEE ANOTHER OPTION? https://www.amazon.com/dp/B077V27B1X WANT TO SEE MORE FROM OUR SHOP? www.amazon.com/shops/IHeartArtandBaby _______________________________________________________________________________ Please note that due to a variety of monitor settings, the color of the garment as seen on your monitor, may slightly vary from the actual color.